306 pages. Most Americans today are aware that jobs are being outsourced to China, India, and other nations at an alarming rate. From factory jobs to white-collar, high-tech positions, the exporting of labor is one of the most controversial issues in America.Yet few people know much about the other end — about the people who are actually working these jobs and how their own lives have been throw into tumult by these new economic forces. Andrew Ross spent a year in China, interviewing local employees and their managers in Taiwan, Shanghai, and the far western provinces. 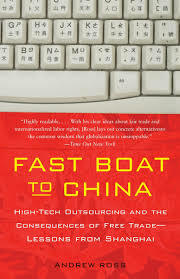 In this engaging and informative book, he shows how the Chinese workforce has inherited many of the same worries as American workers, such as job instability, long hours, and awareness of their own expendability. He reports on the daily reality of corporate free trade and explores the growing competition between China and India. This is an eye-opening exploration of an unseen side of our globalized world.